There are several aspects to consider when embarking on a Bathroom Renovation. No matter what budget you have to work with, the team at Bannochie Builders, Inc. can help you to make amazing updates to your bathroom. Layout – a functional layout is the backbone of any bathroom remodel. It should be set up to fit the needs of your family and have plenty of storage. The experienced design team at Bannochie Builders, Inc. can help you to maximize the space and potential of any size bathroom. Aesthetics – your style can be reflected in the design choices that you make. We will help guide you with value adding choices that fit your style and stay true to your home. Vanities and Sinks – whether you choose to go with a custom vanity or a stylish pre-made version, the vanity will make a statement in the room and help to set the tone. Sink options are quite extensive also with many different shapes, materials and styles to choose from. Our professionals can help you to choose one that is just right for you. Showers and Baths – these can be simple and elegant or a dramatic statement piece. A modern style shower may have a glass enclosure, multiple showerheads, accent tile work and custom built-ins. A separate romantic style soaker tub can turn an average bathroom into a spa experience. Flooring – natural or ceramic flooring options can add style and value while remaining very durable and beautiful. Lighting – an experienced remodeling expert never overlooks the importance of good lighting. It can create drama and is important for the overall functionality of the room. Fixtures – as licensed contractors, Bannochie Builders, Inc. can help you to find energy efficient, functional and elegant fixtures that complete the bathroom renovation. Bannochie Builders, Inc. can transform any outdated bathroom in Edina, MN into a spa-like retreat. We are highly experienced remodeling experts and Licensed Contractors. Our bathroom renovation team can work with any budget and create a bathroom space that is the perfect fit for your home and style. 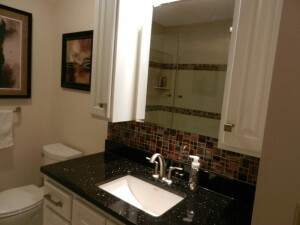 Contact us today for a Free Estimate on Bathroom Remodeling. This entry was posted	on Monday, December 29th, 2014 at 9:29 pm	and is filed under Bathroom Remodeling. You can follow any responses to this entry through the RSS 2.0 feed. You can leave a response, or trackback from your own site.